Some 92% of Americans now have a cellphone of some kind, and 90% of those cell owners say that their phone is frequently with them. This “always-on” mobile connectivity is changing the nature of public spaces and social gatherings. It is also rewriting social norms regarding what is rude and what is acceptable behavior when people are together, a new Pew Research Center report finds. 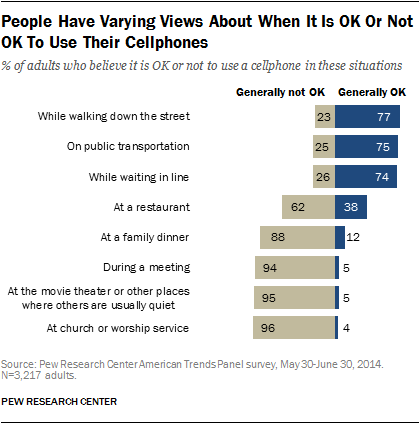 1 Americans see cellphone use as OK in key public spaces, but not in more private or intimate gatherings. For instance, about three-quarters of Americans think it is generally acceptable for people to use their cellphones while walking down the street (77%), on public transit (75%) or waiting in line (74%). But only 38% think it is generally OK to use cellphones at restaurants, and very few say cellphone use is OK at a family dinner (12%), during a meeting (5%) or at church (4%). 2Many Americans view cellphones as harmful and distracting to group dynamics, even as they can’t resist the temptation to use their phones. An overwhelming 82% of adults say that when people use their phones in social gatherings it frequently or occasionally hurts the conversation. At the same time, 33% say that cellphone use in these situations frequently or occasionally contributes to the conversation and atmosphere of the group. 3Cellphones are used more often to make social gatherings more social, not less. Cellphone use during social gatherings is nearly ubiquitous: 89% of cellphone owners say they used their phone during their most recent social gathering with friends, and 86% say someone else in the group used their phone. But cellphone owners were far more likely to use their cellphone in a manner tied to the social gathering than in an antisocial way. Just 16% used their phone because they were no longer interested in what the group was doing; 15% wanted to connect with other people who are strangers to the group; and 10% wanted to avoid participating in what the group was discussing. It was more often the case that people used their cellphone in a manner tied to a gathering such as posting a picture or video of the gathering (45%), sharing something that happened in the group (41%), getting information they thought would be interesting to the group (38%), or connecting with other people known to the group (31%). In all, 78% of cellphone owners cited at least one of these four “group-contributing” reasons for using their phone, compared with 30% who used their phone for one of the three “retreating-from-the-group” reasons. 4 Young adults are more likely to use their cellphones for a variety of tasks and to say it’s OK to do so in social situations. Some 52% of cellphone owners ages 18 to 29 say they frequently use their phone to look up information about where they are going while out in public, compared with 9% of cell users ages 65 and older. 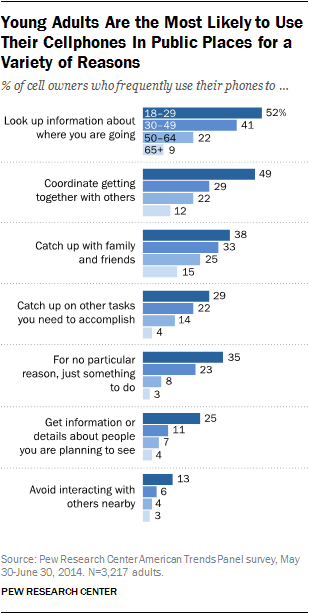 Similarly, 49% of younger cell users say they frequently use their phone to coordinate getting together with others while they are out and about, compared with just 12% of seniors.